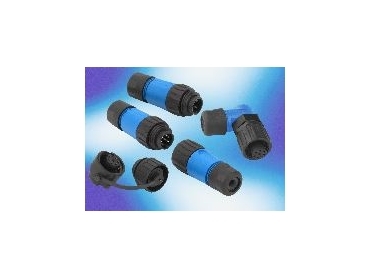 THE eco|mate connectors, available from Amphenol Australia Pty Ltd , are an enhancement of the C16-1 Series and are 100% compatible. The new design of interlocking-parts has been ergonomically shaped and is dirt resistant, enabling mating and un-mating of the connectors under extreme environmental conditions. The cable housing comes with a robust metric trapezoidal thread (to DIN std. ), which not only means higher pull forces for the cable clamp, but also promotes quicker assembly times. The cable outlet is able to clamp cables between 6mm and 12.5mm in diameter by using long flexible fins. Instead of requiring three different variants, as with the previous range, eco|mate covers it with just one version. The receptacle housing includes a moulded fastener allowing a protective cap to be fitted without screws. The eco|mate product range comprises of male and female receptacles, male and female cable connectors both in straight and right angled versions to IP65 or IP67 rating. Contact layouts are 3+PE and 6+PE with screw, solder or crimp termination.